There’s a rule here in America, birthplace of tater tots and the Slanket, that you can import any car that was not officially imported into the United States once that car turns 25 years old. Most commonly, this rule is used for things like Skylines and Land Rovers and those sorts of high-value cars with cult followings. But there’s so much more out there! 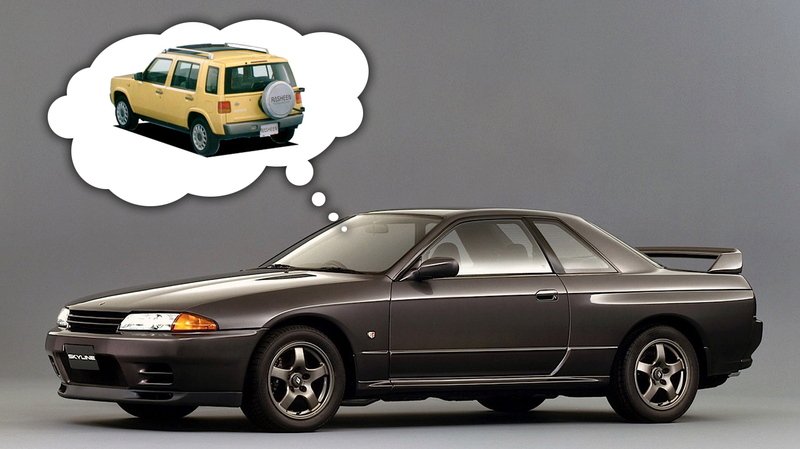 Here’s ten under-considered cars that I think deserve a chance to come to America. To give myself some parameters, I tried to focus on accessibility—I don’t want this list full of Hispano-Suizas or other unobtainable classic titans, I’m looking at fairly new (I mean, relatively—’80s and ‘90s cars) mass-produced, not-too-expensive cars. Stuff you, with a little determination, could actually find and buy and bring over here. Sound good? Let’s see what we’ve got! With all the enthusiasm among the younglings for celebrating the cars of the 1980s and 1990s in events like Radwood, a car like the Volvo 480 should be a hit. It’s got all the best styling cues of the ‘80s and ‘90s—crisp rectilinearity, a wedgy front, pop-up headlights, all that. Plus, it’s a Volvo that doesn’t really seem—to American eyes, anyway—like a Volvo, so it has that wonderful and elusive confusion factor. And, it’s a shooting brake, so it’d be a practical daily driver as well! A strange little FWD Volvo that looks sort of like what a 1989 Honda Prelude wagon might have looked like? What’s not to want? I’ve loved the Whizzkid for a long time: it’s a fun little rear-engined sort-of hot hatch that is supposed to be a blast to drive, and has a strong cult following, especially in the UK. They look like they’d be a viable, practical-enough daily driver, with a front trunk and a rear hatch. Why is nobody bringing these things to the U.S.? I combined these into one entry because they’re both Ford Falcons, but they’re very different cars. The Argentine Falcon is based on the old 1960 Falcon, which they hilariously updated with an ‘80s-style face (and later, blacked out chrome) to try and give it the illusion of modernity. Of course, it didn’t really work, but I sort of love the result. It’s a ‘60s-style Ford sedan with an inline-six and black plastic ‘80s details. There’s nothing quite like it. People should bring them here, if only to freak out rockabilly Falcon die-hards. The Australian Falcon is a very different beast, and I’m thinking the XE generation would be good: crisp ‘80s looks with big V8 engines. A big car that feels like an American car, but just somehow...different. You could even get them with a three-on-the-tree transmission! I know I’m something of a rear-engine fetishist, but I figure there has to be more people afflicted like me out there, and they should consider these cars. Pre-Volkswagen Skoda (up to 1991 or so) used to make a lot of rear-engined cars, some of which were actually pretty fun and engaging to drive. Skoda had a strong rally presence with these things, as well. Sure, they were often underpowered and the build quality may not have always been so hot, but there’s just something cool, I think, about rear-engined Skodas. The one up there is the 130 Rapid, a sporty version, but there’s four-door sedans and other body styles, too. Plus, their hoods open from the side, which is guaranteed to get stares. These really should be a thing for people in the U.S. who want something vintage-looking, but with some modern updates. The Ambassador kept the same British 1950s Morris Oxford body, but kept updating the mechanicals over the years. You can get one from the 1990s with a good Isuzu diesel engine in it. These things should be the darlings of the Biodiesel people! I’ve even driven one, and I can tell you that, while they’re not exactly quick, at all, they are comfortable and would make an eternally-amusing daily driver. Gurgels are amazing Brazilian cars, off-roaders, and trucks, all based on normal air-cooled Volkswagen running gear, so they’d be easy to maintain and run here in America. With Microbuses and other vintage VWs going for crazy money now, why aren’t people looking into unique alternatives like these? Plus, anywhere you park it will instantly look like a low-budget sci-fi movie set on Mars, a huge life improvement. Okay, we’ll have to wait a few months before these become legal, but when they do, hot damn. The Rasheen was a four-wheel drive sort of proto-crossover, with interesting and simple styling. It’s got a character and style like one of the Pike factory cars (Be-1, Pao, Figaro, S-Cargo) but it’s larger, more powerful, and arguably more practical for the American market than the true Pikes. We’ve already rejoiced over the possibility of bringing first-gen Twingos to America, and I’m happy to re-iterate that glee. Twingos are practical, efficient, fun, happy-looking cars with a great design. These seem like an ideal starter funky car for lots of people. I hope we start to see these happy goofballs bopping around American roads. Old Citroën 2CVs are getting pretty pricey now, and while I love them, it’s hard to justify spending $10,000 or more on a two-banger tin snail like the Deux Cheveaux. Luckily, there’s a loophole: an IES Super America! The IES Super America was an Argentinian-built 2CV, mildly updated for the 1980s. It has all the quirky 2CV charm, but with an actual hatchback and strange black plastic ‘80s-style front-end treatment, which, I weirdly sort of like. More importantly, it’s a way to get into 2CVs and old Citroën motoring for a hell of a lot less than their French brothers. I’m sure you have other ideas, both about cars to import and manners and ways in which I’m an idiot, and I’m eager to hear both. I mean, there's plenty of Skylines here already, right? Right?